Over the past few months, we have seen two makers of video cards laying the groundwork for Mini-ITX graphics adapters based on the Radeon RX Vega GPU. 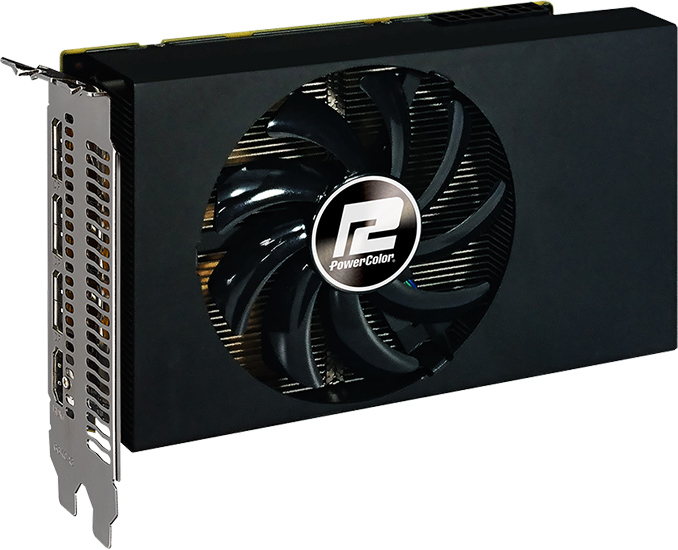 This week PowerColor confirmed that its small form-factor Radeon RX Vega is incoming and will be showcased next month at Computex. PowerColor’s RX Vega 56 Nano Edition will be based on a PCB that resembles the one used for the Red Dragon RX 56 card introduced in late March. The new graphics adapter will feature four display outputs: three DisplayPort 1.4 and one HDMI 2.0b. As for power connectors, it will have one 8-pin and one 6-pin header. The board will be outfitted with a dual-slot cooler featuring one large fan and heat pipes. Keeping in mind that the main draw of AMD’s original Radeon R9 Nano was its compact size as well as lower TDP, we certainly expect PowerColor's Mini-ITX RX Vega 56 to go the same direction. AMD's reference Vega 56 has a 210 W TDP, so PowerColor would need only to turn the card down to 175W to match AMD's previous card and similarly keep heat dissipation in line with what AMD's cooler could do. The biggest differences/unknowns right now are that whereas AMD's Radeon R9 Nano used a fully-enabled Fiji GPU - fully embracing the idea of going wide and slow - PowerColor is using a cut-down Radeon RX 56-class Vega GPU. So it will be interesting to see what actual performance is like; PowerColor faces a smaller need for power savings, and there are numerous signs that AMD pushed the reference Vega voltages a bit hard to hith higher clockspeeds, so PowerColor may only need to back off clockspeeds slightly to hit their goals. Production of AMD’s Radeon RX Vega GPU is in full swing, so expect PowerColor to start sales of the product shortly after its first demonstration at Computex. Pricing of the RX Vega 56 Nano Edition adapter is unknown and given the market situation, it is not a good business to make predictions here. from launch price to greed priced 0 to 60 in .0001 seconds wait for it! For what its worth, I've seen some 1070s/1080s for MSRP in a couple places lately: Massdrop had one, Amazon did as part of a Gold Box, etc. Yes, this is partly because the Nvidia's next GPU release is impending, but it's still refreshing to see.